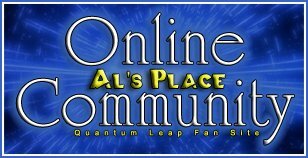 Welcome to the Al's Place Quantum Leap Online Community. Please read these guidelines before posting for the first time. New Member posts are moderated! Need help? Have a question for the bartender or moderators? Come in and get the answer to your question... it won't even cost you a nickel! So... will that be regular?... or schooner? Updates to the main site? Add your comments and questions about Quantum Leap! Welcome to The Leap Back 2009 Quantum Leap Convention information forum! DVD news is here. Check out what happened in Los Angeles, CA, March 2009. Post and read news about the official Quantum Leap Blu-ray and DVD releases, as well as watching on Streaming services such as Netflix. Rate and review each episode of Quantum Leap! Discuss the official Quantum Leap novels! Discuss the official Innovation Quantum Leap Comic Book series! Discuss all the characters of Quantum Leap from Al to Ziggy! Post and read news about the long-rumored Quantum Leap revival efforts. Also discuss other Time-Travel series and check out info on Fan-Films such as the first one professionally made titled "A Leap to Di For" from RACSO Films. The home of "Quantum Leap: The Virtual Seasons" fan-fiction forum! Discuss & visit the Quantum Leap Radio Files website! Share links to Quantum Leap music videos and other related video clips! Also post your favorite character theme songs. Post your Quantum Leap drawings, paintings, and computer creations for others to enjoy! Publish your Quantum Leap stories here! Start a Round-Robin story that everyone can participate in writing! Are you a "newbie" to the forum? Introduce yourself with a first post here so we can give you a proper leap-in! If you want to chat about subjects unrelated to Quantum Leap, this is the place! Birthday & Special Occasion Greetings! Wish your fellow Leap fans a happy birthday or other special occasion - especially if it's a leap year! Post all your smileys and cool icons here! The Sci-Fi.com QL messageboard has been closed. Here are archives from the many important discussions held on that board. Most users ever online was 4,723, 01-20-2016 at 05:09 AM. All times are GMT -4. The time now is 01:01 PM.